Hailing Jacqueline Kennedy Onassis (aka Jackie O) as my summer style icon is not an original statement, but it's an important one, and I'll tell you why: The former first lady was an icon both of her time and still in her legacy. She's also one of the most searched-for people on Pinterest—especially for her cool '60s style. While that era of her style is incredible, it is somewhat inaccessible. However, her 1970's holiday wardrobe is quite the opposite. During her summer holidays, Jackie stuck to one simple uniform that is so easy you can re-create it today. Her basic holiday wardrobe formula consisted of a simple top (T-shirt or blouse), white trousers, chic leather sandals, her namesake Gucci bag, a scarf and oversized sunglasses. Easy, right? To take this look to the next level, Jackie would colour-coordinate by matching her top to her bandanna. Being matchy-matchy might sound too cute for some, but this simple move amps up a basic look. Trust me. In this outfit, she swapped out her white trousers to add a belt and some print in the form of a brown polka-dot skirt. 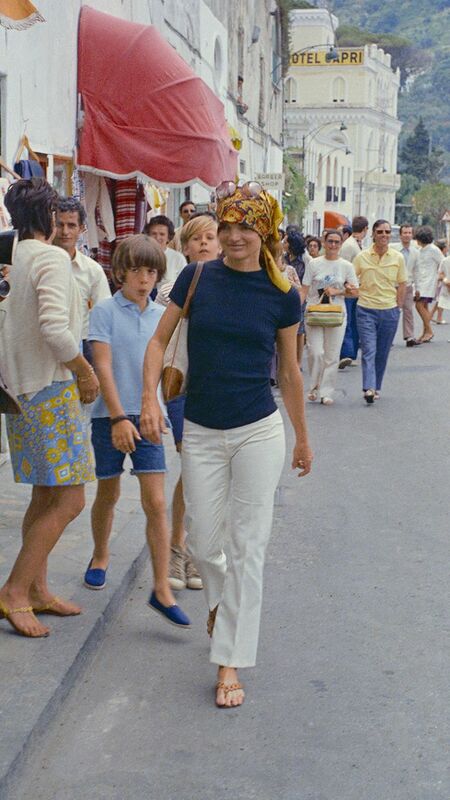 Her sister, Lee Radziwill, is also a fan of keeping things simple. Here, Jackie once again swaps out her white trousers. This time, she added in a bold mustard colour instead of the polka dots. The effect is this colour-blocking look. Instantly iconic. Keeping the white trousers and oversized sunglasses, Jackie chose to change out a plain top for a forever-classic Breton top. So understated and elegant. Instead of trousers, she wore a khaki wrap skirt with pockets. Voilá! Looking through Jackie O's summer style shows you how far a capsule wardrobe can take you—even one that is 40 years old. If you find your base outfit, subtle changes can take you through the whole summer looking as chic as one the most legendary fashion icons. If you have any questions about what to buy or how to re-create this look, ask our Facebook community.